So this was supposed to be a Peanut Butter S'mores Pizookie--which is a copycat from a place called BJ's Restaurant and Brewhouse. However...this didn't exactly end up being close enough for me to call it that--I made a slight mistake and did a skillet brownie instead of cookie. So-it's not the same. BUT it is YUMALICIOUS and perfectly deserving of its own title. 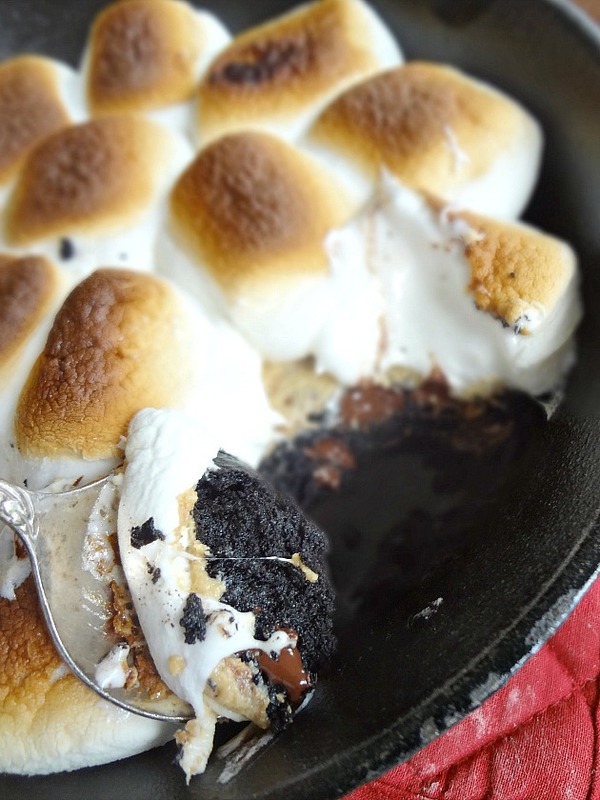 So PB S'mores Skillet Brownie, here we are! Essentially we have a super fudgy and dense and chocolatey brownie (with chocolate chips/chunks) baked in a skillet. THEN there's a layer of peanut butter. THEN we put some marshmallows on top and get 'em all toasty. And the result is gooey and rich and really just awesome. Michael would've liked this better if it had just been the brownie and peanut butter without the toasted marshmallows...because I've married a weirdo. BUT-more for me!!! Even though this is a medium sized skillet brownie...and even though I'm pregnant (although honestly my appetite has gone down if anything so far)-I did not finish the whole thing in one sitting! I cut off little wedges to eat over the course of a few days. But if you eat it all at once I will do nothing but love and admire you. I mean...it's messy. And gooey. As all the tastiest things are! 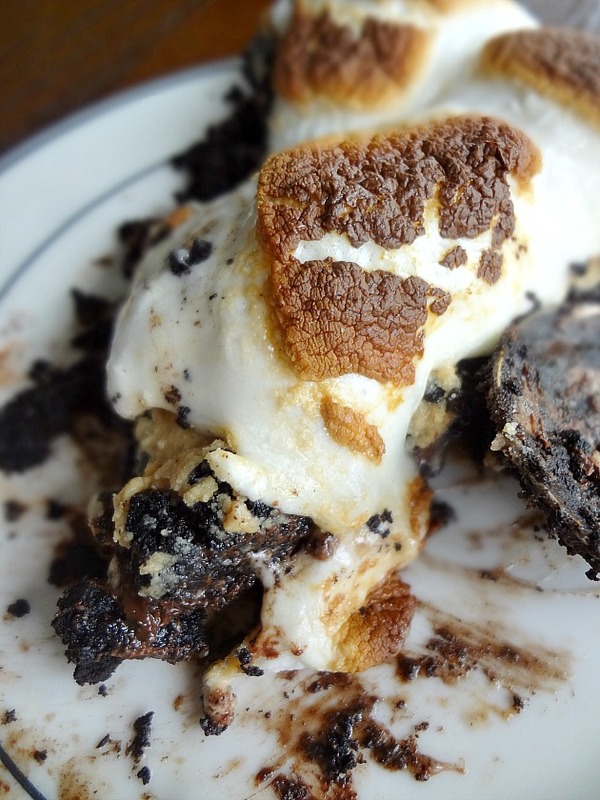 Adapted from these brownies and somewhat inspired by BJ's restaurant pizookie. 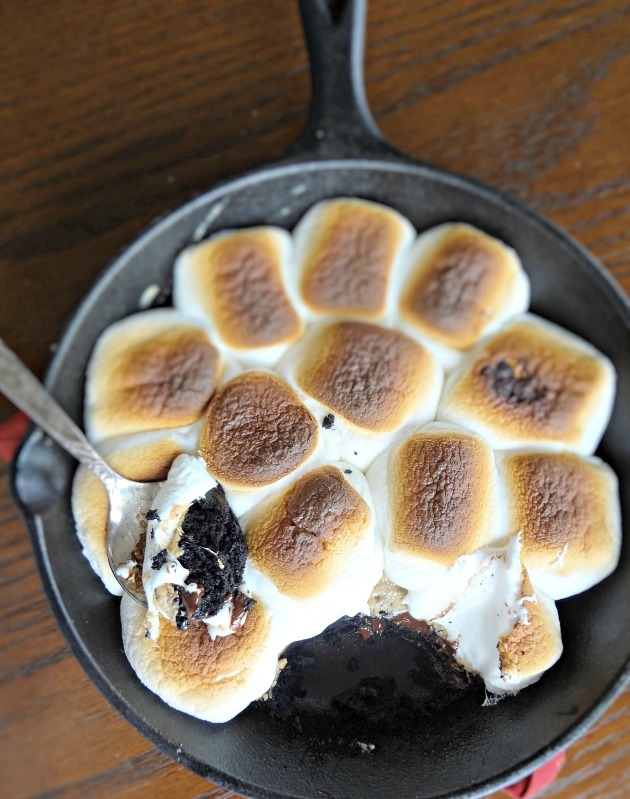 Makes one 8 inch skillet brownie. Position rack in the lower third of the oven, preheat to 325F degrees, and get an 8 inch cast iron skillet set out (or grease an 8 inch cake pan with nonstick cooking spray or butter). Combine butter, sugar, cocoa powder, and salt in a medium (heat-proof) bowl and microwave on high for 1 minute. Remove and stir until smooth-let cool until just warm, no longer hot. Stir in the vanilla extract to the slightly cooled chocolate mixture. Vigorously stir in the egg. Mix in the flour until you can't see it anymore and then vigorously stir for about 40 strokes. 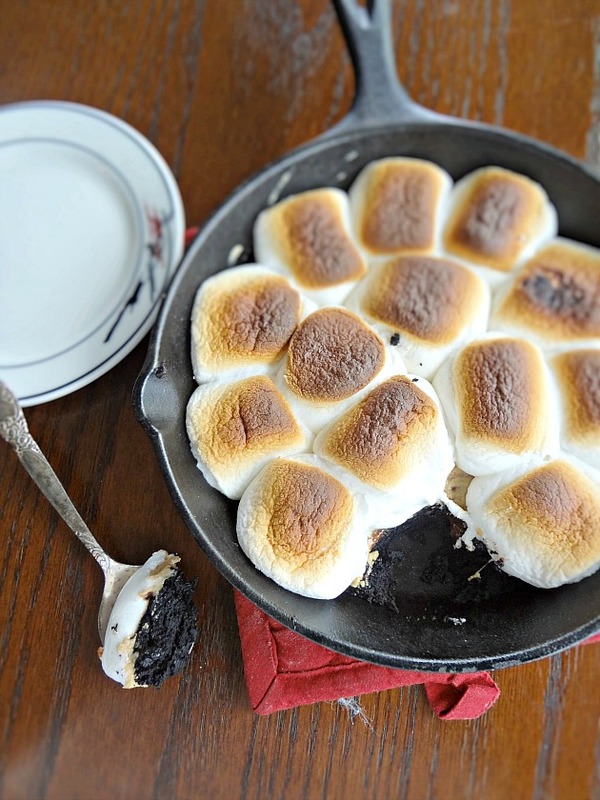 Evenly spread the brownie batter into the cast iron skillet or prepared cake pan. Bake for about 20 minutes, or until a toothpick inserted into the center comes out mostly clean. 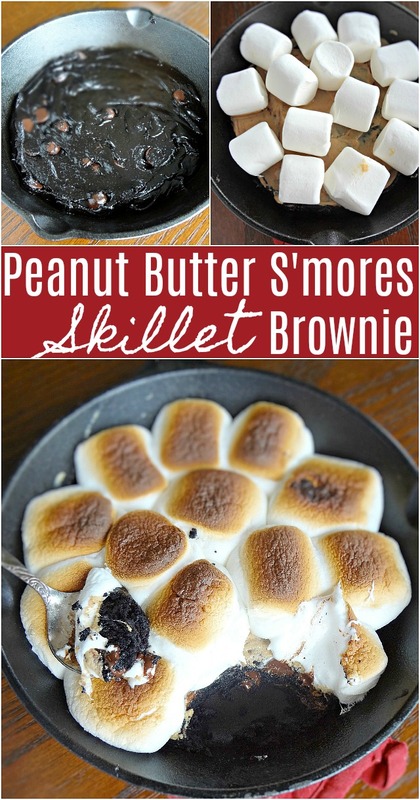 Spread the baked brownie with melted peanut butter and cover the top with marshmallows. 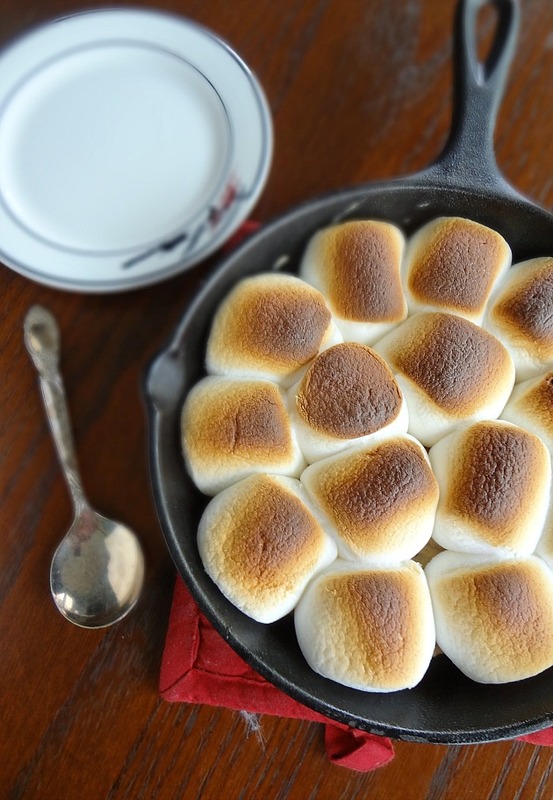 Place under the broiler until the marshmallows are toasted and browned. Let cool for at least 10 minutes, then dig in! Store leftovers, covered, at room temperature for up to 5 days.